South Korea’s Unification Minister said Wednesday that North Korea’s denuclearization process had yet to get “fully on track,” indicating that the Seoul government believes Washington and Pyongyang have yet to properly discuss corresponding measures for the North‘s steps towards denuclearization. “Regarding the issue of North Korea’s denuclearization, it would be an accurate assessment to say that the process (of talks between the US and the North) is not fully on track at the moment,” Unification Minister Cho Myoung-gyon told reporters. “There have been a US-North Korea summit and interactions between ranking officials from both sides, but we remain at a stage where both sides are struggling to be on the same page regarding practical and corresponding measures on denuclearization,” he added. Cho’s remarks come amid stalled denuclearization talks between Washington and Pyongyang. There have been no further signs of progress on the talks since US Secretary of State Mike Pompeo traveled to Pyongyang in October, when the two sides apparently discussed a second US-North Korea summit. The summit, which was first mentioned by US President Donald Trump in October, has yet to materialize. 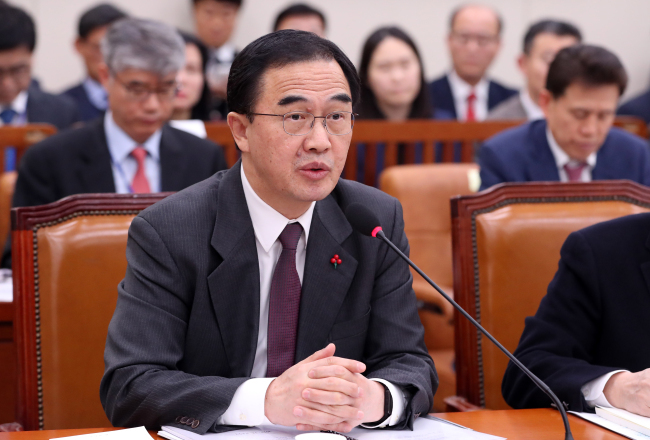 A high-ranking government official later explained that once both sides start discussing detailed corresponding measures, the process will gain traction or enter a new stage. The official also noted that the lack of trust between the US and North Korea was an obstacle to the negotiations. “North Korea said that if the US takes corresponding measures it would accept inspection of the Yongbyon nuclear complex. But it seems the problem stems from North Korea’s struggles to ‘calculate’ whether it will be able to safely secure sanctions relief when it makes that move,” he said. But the official added that Washington and Pyongyang are starting to “understand each other a little,” suggesting that the government is still optimistic that both sides will continue the momentum of dialogue. The official said Pyongyang could start by declaring a nuclear freeze, then move on to partial or complete dismantlement of its nuclear weapons upon submitting an inventory of the weapons. It could then accept relevant inspections in cooperation with the International Atomic Energy Agency. The US, in return, could take nonpolitical and nonmilitary measures, sign a peace treaty, or establish diplomatic relations with the North, he added. A point man on inter-Korean affairs, Cho also said that 2019 will be an important year in determining the prospects of the Korean Peninsula, explaining that countries in the region and other concerned countries have important political events scheduled in 2020. “In that sense, 2019 is an important year and in particular, whether denuclearization will be put on track in earnest during the first quarter or by February and March,” he said, adding that this will determine how things will proceed throughout 2019 and into 2020 on the Korean Peninsula. Though Cho did not specify the political events, North Korea is set to mark the 75th anniversary of the founding of the Workers’ Party of Korea in 2020 and the US presidential election is scheduled to fall late in the same year. Further to the US question, the official pointed to the concerns surrounding the impact of the Democratic control of the US House of Representatives on North Korea issues. He said the Democrats are “more active” than the Republicans when it comes to engagement policy toward North Korea, but given their opposition to the Trump administration, the House is likely to target the administration’s dealings with the North. The official said that there is “no possibility” of President Moon Jae-in and North Korean leader Kim Jong-un attending a ceremony on Dec. 26 in the North’s border town of Kaesong to mark the launch of a joint road and railway project. However, the official did not entirely rule out Kim’s visit within the year, saying it is the government’s position that barring special developments, the visit will proceed as planned.